Myanmar President Win Myint on Wednesday issued a directive to the Yangon regional government to cooperate with the country’s press council to resolve a lawsuit an official filed against three Eleven Media Group journalists accusing them of committing offenses against the state, amid growing disapproval over attacks on freedom of expression. April 2018 marked the second anniversary of Aung San Suu Kyi assuming the position of state councillor of Myanmar. Despite predictions that Myanmar’s tentative steps towards democracy would weaken the country’s long-standing relationship with Beijing, the security situation in Myanmar’s border regions and tepid relations with the West ensure that China remains the Suu Kyi government’s dominant regional partner. Will Myanmar’s ‘Genocide Gems’ Become the New Blood Diamonds? A little more than a year ago, Myanmar’s military carried out what the United Nations has called a campaign of genocide and war crimes against the Rohingya minority, driving almost 1 million people from their homes. Three journalists appeared in Tarmwe township court yesterday to face charges filed against them by Yangon Region. The estranged brother of Myanmar leader Aung San Suu Kyi said on Thursday he is making a new bid to sell the lakeside house where the democracy activist turned politician spent 15 years under house arrest. High-level peace talks attended by the government, Tatmadaw and armed ethnic groups that have signed the Nationwide Ceasefire Agreement have made some progress but failed to resolve differences over the issues of non-secession and forming a national army. Political analysts and government officials in Myanmar on Thursday denounced a move by a majority of member countries of the United Nations Security Council requesting a meeting to hear from a U.N. fact-finding mission that investigated atrocities committed against Rohingya Muslims in Rakhine state. PROMINENT GOLD and jewellery traders have criticized the Union government for appointing a company without a tender to run a One Stop Service Centre for the industry that opened in Yangon’s People’s Park in September. Riot police rushed to the scene of clashes at a strike-hit Myanmar garment factory on Monday after protesting workers say dozens were injured when they were attacked by a mob of “hired thugs”. No decision has been made on the issues concerning non-secession, self-determination, and having a unified army, which are important for Myanmar peace process, during the two-day 10+10 summit in Naypyidaw and they agreed to meet again in November. A Thai court on Thursday convicted two military officers and sentenced each to 27 years in prison for being involved in a transnational crime syndicate that smuggled Rohingya Muslims from Myanmar, officials said. The Rakhine State Chief Minister said today that priority has been given to the security sector for stability and development of the Rakhine State. Aung San Oo, elder brother of Aung San Suu Kyi, filed a special appeal at the Supreme Court in Naypyitaw, in regards to the inheritance of the residence at No. 54 University Avenue currently occupied by Aung San Suu Kyi. Freedom of expression under the National League for Democracy-led government is worsening despite initial hopes of improvement, youth activist group Athan said Thursday, in a mid-term report that documents a litany of charges filed in the past two-and-a-half years under laws that violate freedom of speech. Participants in Myanmar’s special trilateral peace talks agreed to set a timetable and priority work process for basic principles related to democracy and federal in future 21st Century Panglong Peace Conferences. An average of four in every 100 patients is dying due to lack of doctors and nurses in the Sittwe General Hospital in the Rakhine State’s capital Sittwe, the Rakhine State Minister of Social Affairs Dr Chan Thar said. Nine elephant poachers were sentenced to three years in jail on 16 October 2018 after being found guilty of killing a wild elephant at the Okkan Creek, Chaung Sauk village, Taikkyi Township, on 7 November 2016, according to state media. The Eleven Media journalists who are charged with section 505(b) of Penal Code (public mischief) were produced before the court for the first time on October 17 and the court reportedly examined the prosecution first. A European Union (EU) mission will arrive in Myanmar this month to assess the possibility of revoking the nation’s Generalized System of Preferences (GSP) trade status, a punitive move that would devastate key sectors of the local economy. Soe Win has been in his post for less than two months, but already there are significant signs that Myanmar’s new finance minister is ready to deliver on the government’s commitment to boost economic growth. Switzerland has imposed an asset freeze and travel ban (entry and transit) on seven high-ranking members of Myanmar’s military and security forces for human rights violations committed in the country. Construction of the new Myaungmya Bridge in Ayeyarwady Region is 63 percent complete, and the project is on track to be completed in March 2019, according to the Bridge Management Department. Rights groups say action would hurt workers but leave military leaders unscathed. Although the US and European Union (EU) are unlikely to impose sweeping sanctions on Myanmar as a result of the humanitarian crisis in Rakhine, international pressure is mounting in the west to force the country to improve its human rights record. Despite a number of European countries continuing to discourage travel to Myanmar based on allegations against the army of committing crimes against the Rohingya community in August 2017, the government of the Netherlands has eased its stance on one Rakhine State tourist destination last week. In a dusty hut sits Abdul Rahman, a Rohingya who fled Myanmar in 2012 when the ethnic Muslims were violently targeted by the military of the Buddhist nation. Myanmar will implement plans to raise tax revenues in the coming years. Crossing a bridge to the middle of a lake in Myanmar’s Yangon region, pilgrims arrive at a temple to pin their hopes on the pythons slinking across the temple’s floors and draped across windows. The Myanmar Tourists Guides Association (MTGA) said it opposes a move to relax the qualifications for “liaison tour guides” to serve the growing number of Chinese visiting Myanmar. Initial signs when the government took office in April 2016 were promising, the report says: students who were arrested and prosecuted the previous year for marching from Mandalay to Yangon in protest against the National Education Law were freed and pardons were granted to imprisoned activists, workers and farmers. Bus operators have expressed reservations about the final design of the Chan Mya Shwe Pyi (Kywel Sel Kan) bus terminal in Mandalay, which is touted as one of the most modern in the country. More than 170 Rohingya refugees who have returned from Bangladesh to Rakhine State through unofficial channels have moved back home or been resettled in villages where they have relatives, according to Maungdaw District authorities. The collection includes luxury properties in coveted destinations such as Rio and St. Petersburg, and offers guests once in a lifetime experiences in Myanmar and Machu Picchu. As chair of Mon State Parliament’s Women’s and Children’s Rights Committee, Daw Khaing Khaing Leh is dedicated to protecting the region’s youth and female constituents. When speaking of religious intolerance in ASEAN member states, it’s likely that images of marginalised Rohingya in Myanmar, the increasingly conservative stance of Indonesian President Joko “Jokowi” Widodo seems to have recently taken, and clampdowns on the Lesbian Gay Bisexual Transsexual (LGBT) community in Muslim majority countries like Malaysia and Brunei are among the first pictures that come to mind. 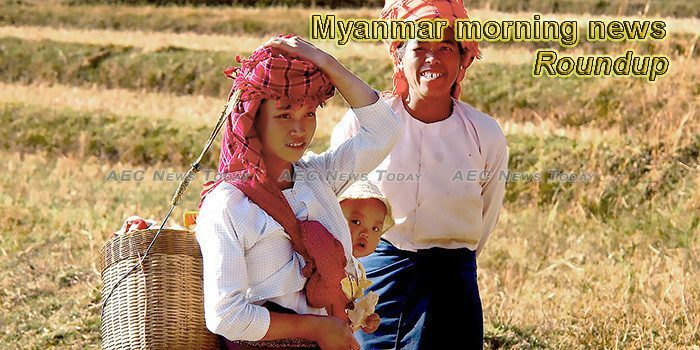 This week’s Myanmar morning news feature photo acknowledges International Day of Rural Woman, October 15.